beaverchewed, originally uploaded by jahansell. 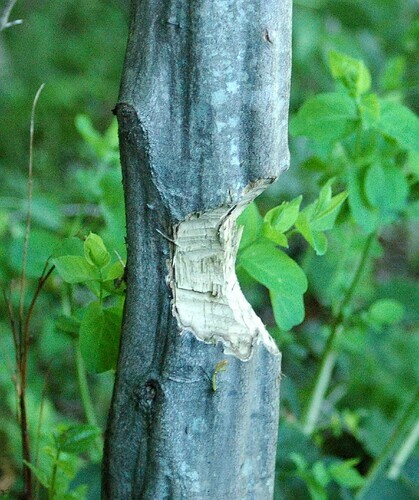 If I can't get a picture of a beaver, at least I can show you their handiwork (toothiwork?) Beavers have an astounding impact on the landscape, creating flooding and causing water levels to rise dramatically on ponds and lakes. I went to a talk recently about the planned extension to the Harlem Valley Rail Trail, and "beaver activity" was one of the main obstacles in several places - the railbed was completely flooded in large sections. wonder how long that's going to stand....strangely,i never knew they could that! I could have done with their help when I was trying to decrease the size of a small tree in my garden the other day. It took me ages! Think of the land the beaver lost as human development brached out. They don't have many choices. I like your photo. Oh yes, I have seen these marks before, the beaver(s) chopped down at least half a dozen laurel trees along the river bank where I used to live in Avignon! this made me laugh! I've never seen a really munched tree trunk before!